Most people understandably prefer not to stay very long in Agra, as it's a rather unappealing city with a lot of touts. However, there are quite a few worthwhile places to visit in Agra and around, apart from India's most famous monument -- the Taj Mahal. The many interesting remnants of the Mughal era will surprise you and the crazy, congested bazaars of the Old City will fascinate you. It's possible to experience village life and get close to nature as well. Completed in 1653 A.D., The Taj Mahal built by the Mughal Emperor Shah Jahan as the final resting place for his favourite Queen, Mumtaz. Finished in by Marvel, it is perhaps India most fascinating and beautiful monument. This perfectly symmetrical monuments took 22 years (1630-1652) of hard labour and 20,000 workers, Masons and Jewellers to built and is set amidst landscaped gardens. Built by the Persian architect, Ustad Isa, The Taj Mahal the bank of the Yamuna river. It can be observed like a Mirage from the Agra Fort from where Emperor Shah Jahan stared at it, for the last eight years his life as a prisoner of his son Aurangzeb. It is a masterpiece of symmetry, Seeming to be floating in the air from a distance, and each revealed as an illusion experienced as one enters through the main gate. The verses of Holy Koran as inscribed on it and at the top of gate 22 small domes, signifying the number of years the monument took to built. 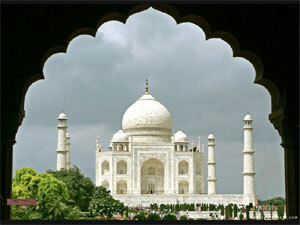 The Taj Mahal has been built on a Marvel Plateform that stands above a standstone one. The most elegant dome of the Taj, with diameter of 60 feets, rises 80 feets, over the building and directly under the dome is the tomb of Mumtaz Mahal. Shah Jahan's tomb has been irected next to her's by his son Aurangzeb. Fantastic Inley works using semi-precious stones decorate and interiors. The great Mughal Emperor Akbar commissioned the construction of the Agra Fort in 1565 A.D., although additions were made till the time of his grandson Shah Jahan. The forbidding exteriors of this fort hight an inner pardise. The fort is crescent shaped, flattended on the east with a long, nearly straight wall facing the river. 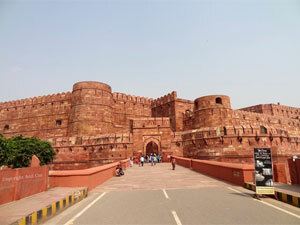 It has a total perimeter of 2.4 k.m., and is ringed by double castellated ramparts of red sandstone punctuated at regular intervals by bastions. A 9 mt. wide and 10 mt. deep moat surround the outer wall. There are number of exquisite building like the Moti Masjid-a white marvel mosque akin to a perfect pearl, Diwan-e-Am, Diwan-e-Khaas, Jehangir's Palace, Khaas Mahal, Shish Mahal and Musamman or Samman Burj-where Shahjahan was held captive in 1666 A.D.
Open Time: Sunrise to Sunset. The mausolumn of emperor Akbar represent his philosphy and secular outlook, combining the best of Hindu and Muslim architectures in a superlative region. Completed in 1613 A.D. by his son Jahangir, it is one of the well preserved monuments. This is the last resting place of the Mughal Empror Akbar. 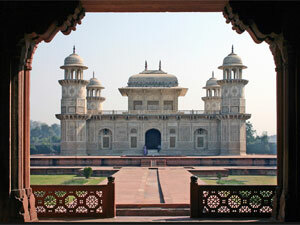 Itmad-ud-Daulah is the tomb of Mirza Ghyas Beg, a persian who had obtained service in Akbar Court. The Marvel tomb was made by Emperor Jehangir's Queen, Noorjahan, for his father Mirza Ghyas Beg during 1622-1628 A.D. 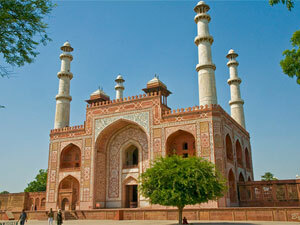 The Craftmanship at Itmad-ud-Daulah foreshadows that of the Taj Mahal. It was here that. "Pietra Dura"-the inlay work on marble-so characteristic of the Taj-was first used. 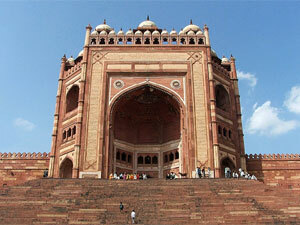 Fatehpur Sikri is an epic in red sandstone. A city of yeasteryear, today lost in the mists of time. Fatehpur Sikri was built by the Mughal Emperor Akbar during 1564 A.D.. Mughal Emperor Akbar had no heir. He visited holy men to enlist their prayers for his son. When he visited Sheikh Salim Chishti who was living at the village of Sikri the saint foretold the emperor that he would be blessed with a son. When is son was born, he is gratitude, constructed his capital city and named it Fatehpur Sikri. Later, due to sortage of water and unrest in North-West, Akbar has to abandon this city. The beautiful marvel tomb of Sheikh Salim Chishti still attract thousands who seek blessings of the revered saint. Other renowned places are Dewane-e-Am, Dewane-e-Khaas, Buland Darwaja, Panch Mahal, Jodha Bai Palace and Birbal Bhawan. Fatehpur Sikri is about 39 K.M. from Agra. If you don't want to pay the costly admission fee or battle the crowds to visit the Taj (or just would like an alternative perspective of it), you can see it from across the river bank. 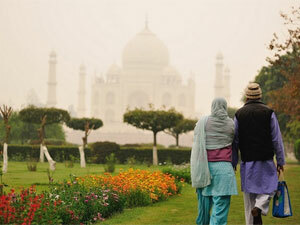 One such place there is Mehtab Bagh, "The Moonlight Garden". This 25 acre Mughal garden complex is situated directly opposite the monument and was actually built before the Taj, by Emperor Babur (the founder of the Mughal Empire). It fell into ruin but has been beautifully reconstructed. The entry cost is 100 rupees for foreigners, and it's open until sunset.